Material: ABS PVC. Battery: 3*AG13 Button Battery switch control. 1. Color-changing LED, or single color. 2. Replaceable battery: in-built button cell. 3. Good-looking & welcomed. 4. Environment-friendly. 5. Low-voltage & safe to use HIGHLIGHTS - (1) decorate with artificial flowers, more make flower entertainments (2) decorate the door curtain, curtain, clothing. (3) dceramic tile, glass, car. 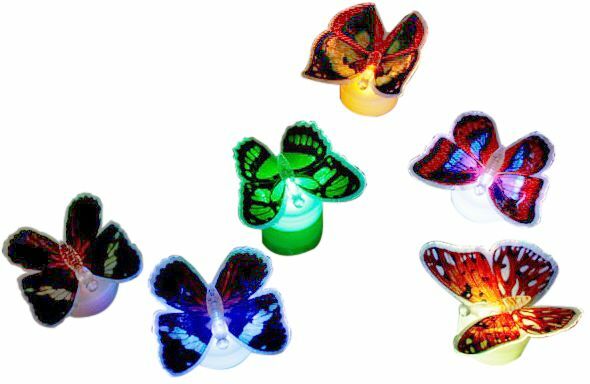 (4) butterflies can be decorated in miniascape flower basket, adornment, flowers (5) In stores, shops, cosmetics store decorated with some butterflies . (6) decorate bedroom furniture, make the person feels vitality, full of humour and wit. (9) gift buffets: unit celebration gifts, product promotional gifts, fast food restaurant, gifts, fair gift.